Volta Cohort helps early stage, high calibre founders attract and secure venture capital sooner. This program provides mentorship, resources and investments of $25,000 through a micro-fund co-founded by Volta, BDC Capital, Innovacorp and the Atlantic Canada Opportunities Agency. organizations in other cities across Atlantic Canada. Volta Cohort participants are selected through an application process. Every six months, Volta hosts a pitch event to determine who is accepted into the program and only those chosen through the application process are eligible to participate. Fifteen high potential applicants will be invited to pitch their business at the Volta Cohort Pitch Event – competing for investment. Up to five companies will be awarded $25,000 at each event. 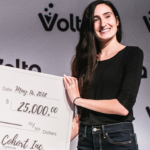 Volta Cohort’s Pitch Events are structured similarly to a pitch competition, where companies go on stage and pitch their company. Companies also have the opportunity to set up a display at the event to provide attendees with more information about what they are working on. These events are open to the public. A selection committee of people from the larger startup ecosystem is established for each event. The committee will select the five companies to be awarded the investment at each event. The next Volta Cohort event will take place on May 22, 2019. Applications for the next Cohort are now closed. "Volta Cohort is the best first step you can possibly take to establish yourself as a business in Atlantic Canada."